The Castilian plane dominates with sobriety and strength this stage, which includes one of the longest and most uninhabited sections of all the French Way. Over the first 17 kilometers trees are scarce with the exception of a few poplars, long and endless straights, without a single village, fountain or shade will make more than one pilgrim feel discouraged. It is worth taking water and food, as well as a hat and skin protection to fight the merciless summer sun. The cereal fields do not let up and only the small hamlets along route with services provide extra life to this long walk. From Calzadilla de la Cueza, the route for walkers during the Middle Ages, a path running parallel to the national road will help the pilgrims to advance at speed. At the finish awaits Terradillos of the Templars, a town where legend places the burial place of the chickens famous for laying golden eggs. This stage, in which the walkers face endless straight stretches without shade or shelter, begins with a brief visit to Carrión (405.3 kilometers to Santiago). Crossing the streets of San Antonio, where they will find the church of Santiago with its famous frieze sculptures, an example of Romanesque splendour. From here the route moves along the streets of Esteban Collantes and Piña Blasco to cross the Carrión river via an asphalt bridge. 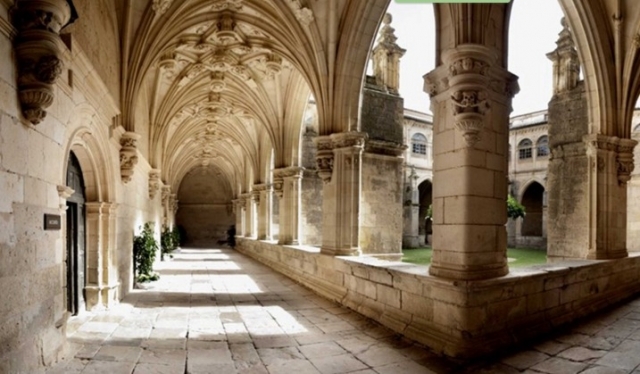 It then reaches the area around the Benedictine monastery of San Zoilo (X century), a must visit, for its Romanesque style and its plateresque cloister and also because it contains the stone coffins of the literary Counts of Carrión. According to the famous Song Cantar del Mío Cid the young princes of Carrion, Don Diego and Don Fernando, married the daughters of Rodrigo Díaz de Vivar. However, after being offended and appearing in the public eye as cowards, they decided to take revenge on their own wives. Cid's daughters were humiliated, whipped, badly beaten and abandoned in the oak woods of Corpes. El Cid Campeador sought revenge upon them. In the monastery walkers can also visit the Centre of studies and Documentation of the Camino of Santiago, here they have a library with over 4,500 volumes of Jacobean themes. The pilgrims can consult different manuscripts among which there is an official genuine replica of the Códex Calixtino. 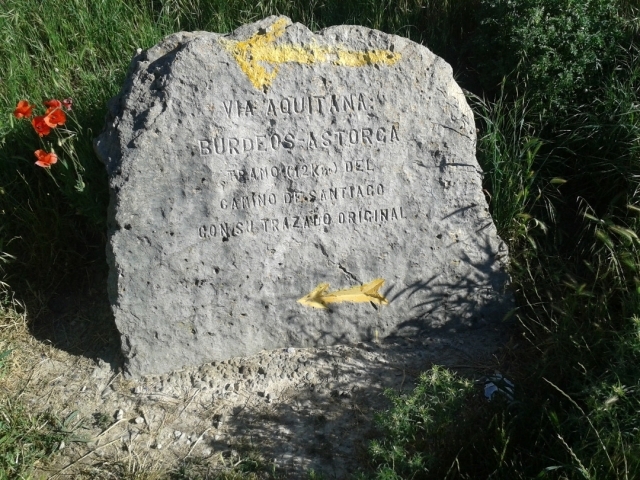 The pilgrims leave the monastery to the left and, on the right hand side, a milestone with the coat arms of Galicia. Proceeding they will arrive at a roundabout, a little dangerous, although well signposted, where without a pavement the CL-615 is crossed. The route continues along Avenida de Donantes, on a stretch where travellers will first pass a Red Cross building and then a petrol station. The arrows on the signs guides them to a junction with the N-120, which is crossed, without a pedestrian crossing to continue again along the PR-2411, a local road with little traffic that leads to Villotilla. Hikers should continue for more than three kilometres on the left side of the cement road and without pavements to accompany them, continue this tough step passing through waterlogged areas. The route involves sections on paths of different widths, although always of easy transit, and even, at times on two-way roads. After crosses a stream they will reach the terrain where previously the Abbey of Benevívere was situated (21.6 kilometers to Terradillos). Today all that remains standing are some ruins from this XII century temple. After crossing on asphalt the Perionda stream, the route abandons the road and enters over the next 12 kilometers the Vía Aquitania, A Roman road that connects Bordeaux with Astorga and that the pilgrimage route still treads in its original layout. On a path of earthy ground with small pebbles, surrounded and escorted on occasion by a row of trees, which fail to provide shade, the walkers advance with monotony using as visual reference the motorway Camino de Santiago, situated 500 meters to the right. On this straight stretch the pilgrims should prepare for a lack of shade and of drinking fountains, it is therefore advisable to approach the route calmly and without haste. They will pass through an area that in the middle Ages was home to two major pilgrim hospitals, of which neither remain, but that would have been a real oasis in the middle of a desert. The first that pilgrims would have encountered was called Hospital Santa María de la Fuente, the hospital of Don García, founded in the XII century. The Hospital later became known as Hospital Blanco. After four and a half kilometres on this path, and after crossing a canal, they arrive at the recreational area Fuente de hospitalejo, which invites pilgrims to take a break, despite having benches there is no shade and no fountain. Advancing on the journey the pilgrims cross a junction with the local road to Bustillo and continue once again, straight ahead. Just before this junction (16.4 kilometers toTerradillos), and only during peak season, it is possible that the pilgrims can have drink in a makeshift bar. On the new stretch of Roman road, the endless long straight path continues, along with the solitude of cereal fields. Only an oak tree that the pilgrims will see on the left serves as a reference point. After periods of heavy rain the path can become waterlogged due to its clay soil terrain. Through the Cañada Real About two kilometers later, the hikers reach the recreational area Cañada Real Leonesa, where a sign informs that this place is a passing area for shepherds on their journey from summer pastures in the province of León to the winter pastures in the communities of Extremadura and Andalusia. This resting area includes outside tables, a covered seating area and a toilet. Accompanied by poplars, the pilgrims continue along a stretch of moderate ascents and descents that leads them to the first stop of stage Calzadilla de la Cueza (Terradillos 9.3 kilometers), a town that, to the despair of the impatient pilgrim remains hidden until the last moment. Leaving on the right a church and a barn they descend the hill rapidly until reaching this small hamlet, which welcomes travellers with an important hostel, it has a drinks vending machine outside and an indoor swimming pool. The route goes around the centre, along its left side and passes its only restaurant, Hostal Camino Real, to continue, now following the signpost on houses and posts, to the end of the centre. It then reach a junction with the N-120, at which hikers should turn right to cross, on asphalt, the River Cueza. Continuing along a path that runs parallel to the left side of the national road and leads to the ruins of the old Hospital del Gran Caballero o Santa María de las Tiendas. The origins of this enclave date back to the XII century to when the Order of Santiago founded in this place a hospital for pilgrims, a seed of the monastery. The accommodation, which operated until the XIX century, was of great prestige on the pilgrimage route for its wealth, size and its tendency to provide generous helpings of bread, wine and cheese. It was for many years an obligatory stopping place for French pilgrims. The great Renaissance altarpiece of the church (XVI century) can be admired today in the church of San Martín in the neighbouring Calzadilla. The route returns to asphalt during a short stretch and then to a narrow and earthy path that runs parallel to the national road. After a gentle climb and subsequent descent the walkers reach a recreational area, here the path forks into two variants. The pilgrims, can either continue parallel to national road until reaching the entrance to Ledigos, an enclave reached after crossing the road and continuing along a detour to the right, or they can pass next to the resting area onto an asphalt track which leads away from the N-120 and 200 meters later turns left and approaches the enclave at its highest point, where the parish church is situated. Either alternative is simple and neither presents problems of uneven ground. They are also the same in terms of distance. 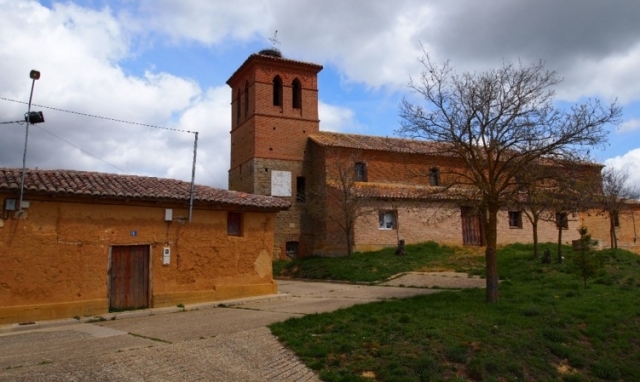 In Ledigos (3 kilometers to Terradillos) one of the main places to visit is the aforementioned temple, dedicated to Santiago the apostle, situated on a hill from which they can see Terradillos de los Templarios, the end of the step. Some Historians note that it is the only church on the route with representations of the three images of Santiago: Pilgrim, Apostle and Matamoros. This small town, until the XVIII century had a public hostel for pilgrims, currently it has a private hostel with a bar, a haven for more than one traveller who by this point will be thirsty. The route crosses the enclave and at the same time bids farewell along a street that runs parallel to the N-120, on its right side. The path, narrow at first, then widens as it advances behind a large public park with sports facilities, a fountain, benches and swings. At the end of the park, the Jacobean route crosses the national road again, this time on its left side, to deal with the last kilometers along a manageable path of earth and embedded stones. The route only returns to asphalt briefly to cross the river Cueza. Shortly after, on the left the large area occupied by the private hostel Los Templarios can be seen, located 200 meters before the town, its pool will entice more than one pilgrim. Those who prefer can continue until reaching the enclave, the end of the stage, to do so they should continue the route and enter a road to the left that will lead them to the Calle Saldaña. The name Terradillos de los Templarios, with its brick and clay houses inspired the saying, (lugar de pequeños techos de tierra o terrazas) " a place of small roofs of earth or terraces." In fact, the village is situated on a simple headland where its first houses were built. However, if it is now known for something, it is for its relation to the knights of the Templar, as it was under the territorial jurisdiction of this order. The Templars were one of the most famous Christian military orders.Founded in 1118, after the First Crusade, led by nine French knights, under the leadership of Hugo de Payens. Its original purpose was to protect the lives of Christians on pilgrimage to Jerusalem following its conquest. As guardians of the holy places, the Templars also extended this role to protecting the Camino de Santiago. In the XII century there was a pilgrim hospital near to Terradillos (now demolished) The hospital, known as San Juan was under the protection of the Templars Knights. According to legend it was also here that the last Templars buried the famous hen of golden eggs. The locals believe that the precious animal is buried at the top Torbosillo. The pilgrims can see this hill if they look to the right along this stage of the route. This is a recurring theme in the areas occupied by the Templars. In fact, Viana, also on the ancient way, is another place where it is also assumed that the chicken is buried. All this is due to the enrichment of the order, provoked by residents who generated different types of legends to explain their wealth. There were other theories that made them masters of the art of alchemy and therefore manufacturers of massive amounts of gold. The truth is that the chicken has long been associated with the precious metal. In Terradillos one widespread legend claims that many years ago there existed a parish, that of San Esteban (currently not preserved), which each year would take a golden egg to Santiago. Until one day, the order of Compostela explained that they did not want a single egg, but rather the whole chicken. To avoid the precious animal from being taken the members of the Templar buried it at the top of Torbosillo. 1 reviews Distance to Santiago: 405 km. 1 reviews Distance to Santiago: 388 km.